This page contains a few notes about John Palmer of Kirkandrews who became head gardener at Knockbrex House. The top photograph shows John Palmer (father) c1915 who received the family photo with the inscription ‘best love from us all, dearest’. He carried it through the rest of his war service in France and Egypt. A copy of the photo was also sent to their eldest son Tom, who was in the Royal Flying Corps. John Palmer (son) wrote that he had followed his father as the working tenant of the meal mill at Kirkandrews. However, when the machinery in the mill had become worn to the extent that it was not worth replacing, the mill was closed down completely. 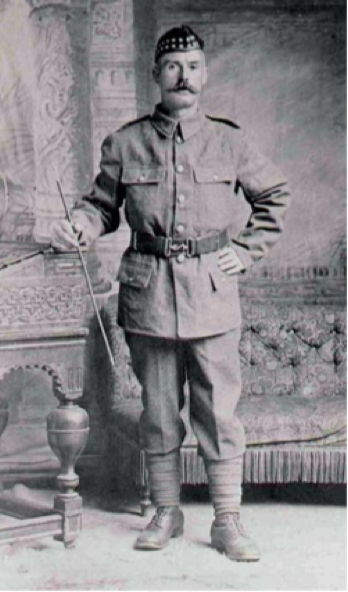 So he accepted the offer of employment in the gardens of Knockbrex, working there until he volunteered for national service during World War I. At the Battle of Gaza he was injured in the right arm by a bullet and although he was handicapped to some extent, he was able to resume his work in the gardens, eventually becoming head gardener there. The formal gardens were renowned for their roses. 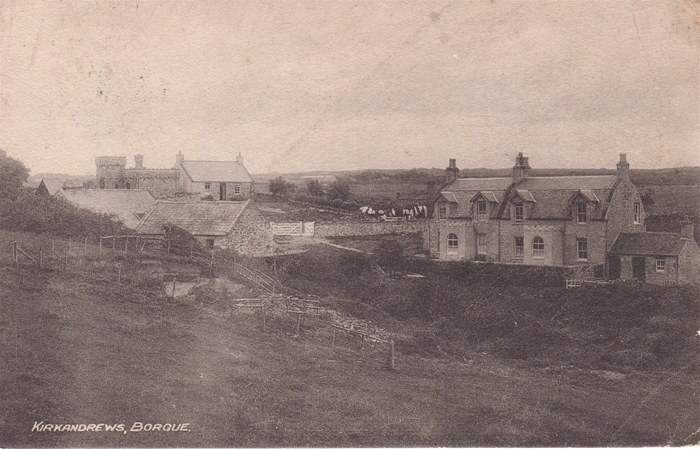 A view of Kirkandrews in the early 1900s. On the left is the meal mill and behind it, Kirkandrews Kirk and John Palmer’s house (now Milnecroft). His mother, Margaret Born 1842) lived in the left upper part of the semi-detached house on the right, the Kirk family lived below and the Crossan family on the right (as shown in the extracts from the 1911 census). 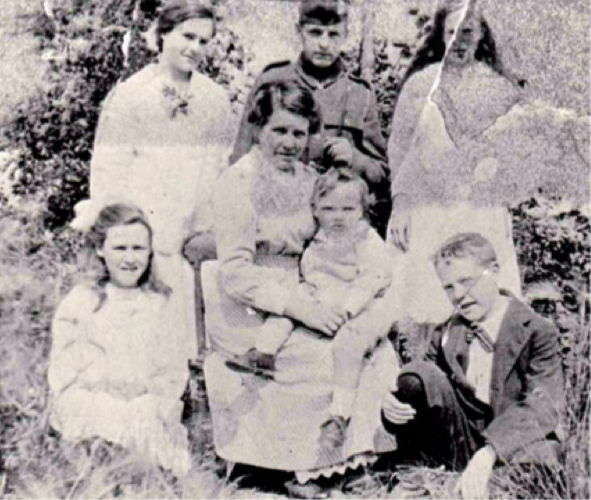 In 1911, John Palmer was the youngest of 6 children so his grandmother, Margaret, who lived across the road would look after him. He recalled drawing, reading by her fire in the winter and playing Draughts. Margaret Palmer kept swarms of bees for the sale of honey and beeswax. They were kept over winter in bee boxes or straw skeps and young John clearly remembered the occasion when he trapped a rat that had gnawed its way into one of her skeps and was devouring the honey left to nourish the bees. From his grandmother, he learned about live in Kirkandrews in the 1860s. The native population just managed to exist, absorbing their nourishment from anything that ‘ran, grew, swam or flew’ – if they could catch it of course. The poor received the maximum sum of 2 shillings and 6 pence (121⁄2p), but they had to establish absolute proof of abject poverty before this parish relief was granted, and consequently they lived by their wits. They depended on the tide’s daily delivery of flotsam and jetsam for fuel and even collected and dried cow-pats as a substitute for coal. Two or three pence provided an ounce of thick black tobacco, with a clay pipe thrown in, and he recalled that it was very common to see an old dame puffing away and looked upon it as a way of life. Farm work provided some income; the going rate for an adult for a 10 hour day was 1 shilling and 3 pence. Whelks were in abundance at low tides and could be gathered and sold. John recollected that women too made quite a good living in the summer months this way; they had a pony and cart, and together with the whelks they gathered themselves, they bought up those gathered by the locals and dispatched the consignments direct to Billingsgate market in London.